York City. She earned a Metropolitan Opera Association and New Orleans Opera Guild scholarship to study voice at the Mannes College of Music in New York. But sadly, during her studies there, her mother died. York and left my vocal studies." When she returned to Loyola, she met a law student named Eddie Knoll (the man she would later marry). He told her she should try law school. She said she’d give it two weeks. "Well, I fell in love with the study of law, and the course of my life changed yet again," Knoll says. Looking back on her career, she is grateful for the education she received at Loyola as an undergrad and a law student. "I believe it instilled in me a great love of learning and a commitment to study," she says. After earning her J.D. from Loyola, she served as a first assistant district attorney for the Twelfth Judicial District Court from 1972 to 1982. She did this while raising five sons. One day, Eddie came home from work and told her there would be a vacancy on the Third Court of Appeal. He suggested she run for it. "I never campaigned in my life, didn’t know how to campaign, and didn't want to campaign,” she recalls. "Moreover, a woman had never been elected to a reviewing bench in Louisiana history." But Eddie made her believe in herself and helped her campaign. Her brother, Paul Theriot, campaigned with her throughout eight parishes. uncontested for my final Supreme Court term," she says. Justice Knoll took office in the Louisiana Supreme Court on Jan. 1, 1997. She will retire from that position at the end of this year. During her tenure, she has read approximately 58,000 writs and authored 184 Louisiana Supreme Court opinions. "I consider myself a diligent student of the law. … It is extremely rewarding to be able to serve the judiciary and the legal profession," Knoll says. “I'm very proud of the fact that the United States Supreme Court has never granted certiorari on any of the very challenging capital cases I authored." Knoll has never abandoned her singing talents, either. 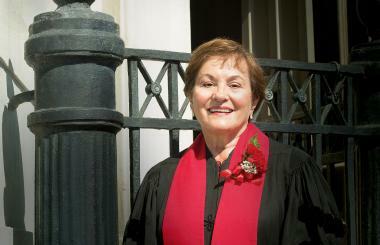 She recently sang with the Loyola Chamber Singers at the annual Red Mass. After her retirement, she plans to help her parish church, St. Joseph’s in Marksville, with its choir and liturgical music. "I will relish being able to devote all of my time to my most important roles—that of wife, mother, and grandmother," she says. "I can’t wait!"